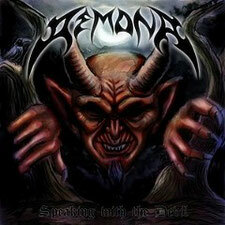 DEMONA will release their second album "Speaking With The Devil" through Infernö Records on December 20th 2013. Originally DEMONA was born in 2007 as a one-woman project in Chile by singer/guitarist Tanza Speed. Now DEMONA is a consolidated band with first level metalers. After a couple of demos, the band started to get recognize in the underground circuit and released "Nightmare" on Cassette from Israeli label ISRAHELL BANGERS, while released it as a 7" vinyl EP from IRON BONEHEAD in Germany. June 2011 saw Tanza moving to Québec, Canada to recruit musicians to play live-shows but also to give DEMONA a complete line-up. The band has recently signed a deal with French label Infernö Records (home of LADY BEAST, ELVENSTORM, AXECUTER, PRIME EVIL, DEATH RIDES A HORSE to name a few) for their new album. "Speaking With The Devil" consists of 11 tracks including intro and outro on CD/Digi-CD/Cassette and Vinyl. You should check out this album, if you a fan of speed metal.